About a week ago Airtel launches Free Zone Service in India with Google. 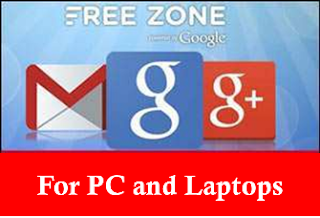 With the help of free zone service we can browse Google Search, GMail and Google + Free with airtel simcard. Click Here To Read Our Post About Airtel Free Zone and its Limitations. As we know this service can be accessed only with mobile devices, smartphones and tablets. We cant use it on PC and Laptops. But here I am presenting a brand New and ultimate trick to Use Airtel Free Zone On PC and Laptops! Here is a simple and easy steps to hack Airtel Free Zone to be work on PC and Laptop's. Click Here To Read our Smart And Easy Tutorial about How to Download, Install and Configure User Agent Switcher to use Airtel Free Zone On Your laptop or PC. Ok.. Now i assume that you have read it! That's all nothing to do More...! How much time would it take to LIKE Bybitz's Facebook Page and encourage me to write more helpful contents for you ? ?